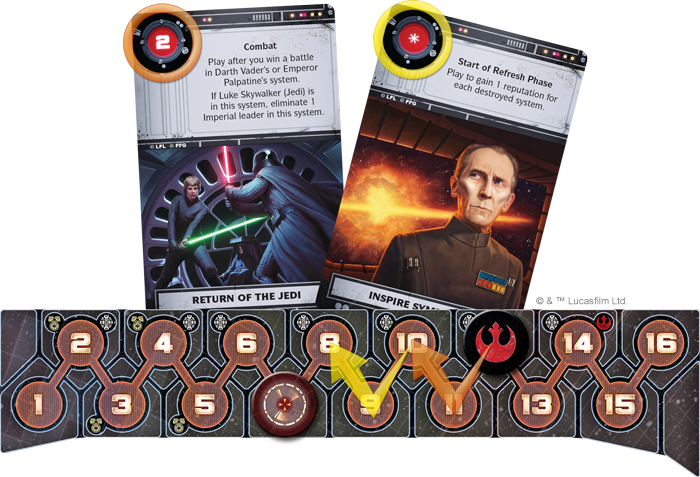 Over the past few days, our previews of Star Wars™: Rebellion have explored the decisions you have to make in the game's Assignment phase, the ways that you and your opponent trade actions during the Command phase, and the combats that can erupt. Today, we continue our previews with an overview of the game's Refresh phase, in which you can build new starships, recruit new troops, deploy new vehicles, and call upon the talents of new heroes willing to commit themselves to your cause. “We shall double our efforts." The Refresh phase stands apart from the other phases of Star Wars: Rebellion. All the player actions from the Assignment and Command phases can be summarized in just two sentences, but the decisions that you make lead to all sorts of action, adventure, and battles with far-reaching consequences. On the other hand, the Refresh phase features a half-dozen different steps, but they tend to flow very quickly. Launch Probe Droids: The Imperial player draws two probe cards. Draw Objective: The Rebel player draws one objective. Advance Time Marker: The time marker advances one space along the track. If it lands on a space with a recruit icon, you draw two cards from your action deck and recruit one of the leaders shown on those cards, adding it to your leader pool. If it lands on a space with a build icon, you generate new units based upon the resource icons in the systems that are loyal to you or that you have subjugated, and you add those units to the build queue. Deploy Units: All units slide one space down the build queue, and all units that slide off the "1" space are deployed to loyal or subjugated systems. The Rebel player deploys first. In many respects, the Refresh phase can feel somewhat automatic, and its action often seems more fated or inevitable than the action of the Assignment or Command phases. Nonetheless, you will also be required to make some monumental decisions in the Refresh phase – even if those decisions might not feel monumental at the time – and its seemingly automatic actions owe directly to the choices that you made in previous rounds or phases. The first thing you do in the Refresh phase is retrieve your leaders, and while it may sound exceedingly simple, there are a number of notable complications. First of all, the Galactic Empire has access to a number of missions, including the basic mission Capture Rebel Operative , that permit the capture of Rebel leaders. 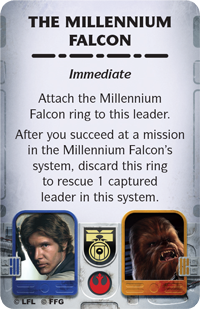 When the Imperial player successfully captures one of the heroes of the Rebel Alliance, that leader is slotted into the Captured Leader attachment ring, one of several rings that define specific game states and rules for the leaders within them. 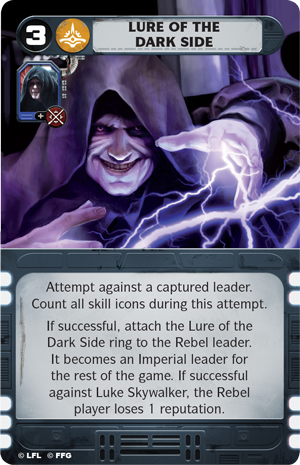 There is only one Captured Leader attachment ring, so the Empire can only hold a single Rebel leader in the Captured Leader condition. However, it is possible for the Imperial player to freeze that leader in carbonite or even turn that leader to the dark side. In such a case, the leader receives a new attachment ring, corresponding to its new condition, and the Captured Leader attachment ring once again becomes available. Notably, then, a captured leader is not returned to the leader pool during the Refresh phase. During the Command phase, Elaine sent General Rieekan to Sabotage the Imperial resources on Bespin. She succeeded, but Karl, who had assigned Darth Vader to Capture Rebel Operative, then sent Vader to Bespin and captured General Rieekan. Karl slots General Rieekan into the Captured Leader attachment ring, and Elaine is not able to return General Rieekan to her leader pool during the Refresh phase. 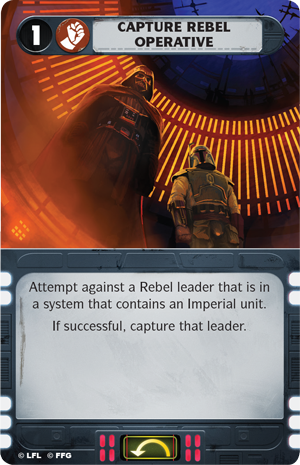 Note that the capture of one of your leaders has consequences that go far beyond whether or not you can return all your leaders to your leader pool in the Refresh phase. Given how important your leaders are to your strategy, you cannot afford to lose them and fall behind in the number of actions you can take each turn. 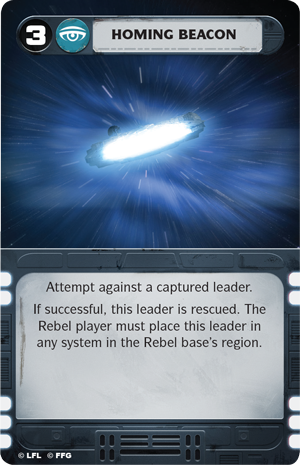 Accordingly, if your Rebel leader is captured, you will want to rescue that leader as quickly as possible by completing a Daring Rescue or a similar mission. The fact that your hand of missions caps out at ten creates a small measure of tension as you consider if and when you want to attempt some of the game's more challenging missions. At the beginning of the game, you start with six missions – your four basic missions and the top two cards from your mission deck. This means that even if you choose not to attempt any missions, you do not have to worry about discarding missions until your third Refresh phase. However, if you allow yourself to draw past your cap, you may lose out on some valuable opportunities. 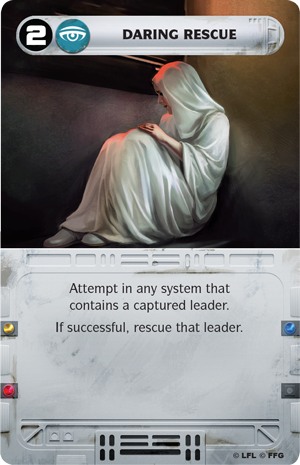 For example, the Galactic Empire can attempt a number of different missions against a captured leader, including Homing Beacon , Interrogation , and even Lure of the Dark Side . 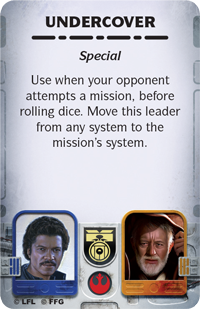 However, all of these require that you first capture a Rebel leader, and if you have not captured a Rebel by the time you need to discard mission cards, you might consider discarding one of these missions. But if you did, would that decision come back to haunt you? 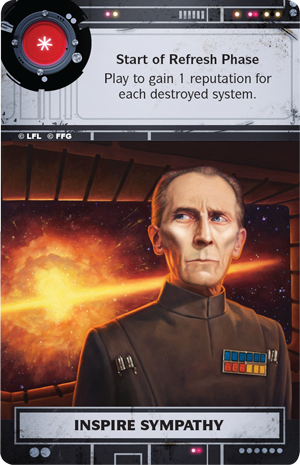 You would potentially lose the ability to narrow down the location of the Rebel base to a single region of space, to view all of the Rebels' objectives, or even to strike a massive blow to the Rebel Alliance by converting one of its leaders. Every Refresh phase pushes the game closer toward its climactic conclusion. 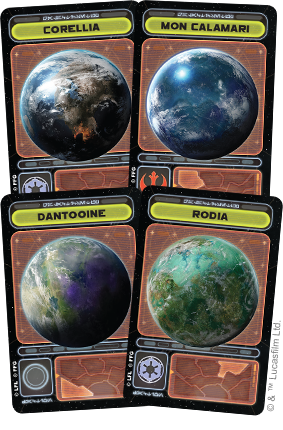 As it draws probe cards, the Galactic Empire narrows down the number of systems in which the Rebel base could possibly exist. 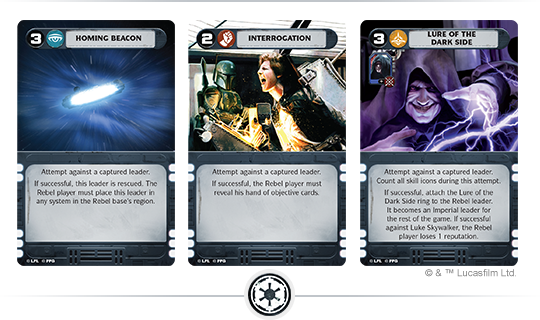 And each objective card offers the Rebel Alliance a new way to make itself heard. As the Rebel player, you watch the Imperial player's hand of probe cards grow ever larger and follow the Empire's movements through the galaxy, realizing that your window of opportunity is rapidly shrinking. As the Imperial player, you recognize that every turn you do not eliminate the Rebel base is another turn that the galaxy's citizens continue to whisper about freedom. 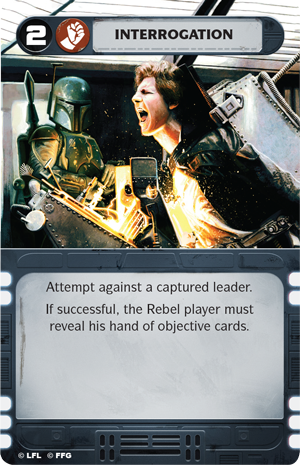 You also realize that each of the objective cards in the Rebel player's hand constitutes a different sort of threat. No one of those threats can break you, but the more your opponent is able to aim toward the completion of objectives, the greater the chance that you might watch the Rebel Alliance suddenly earn five reputation points by scoring Return of the Jedi during combat and then scoring Inspire Sympathy for two more reputation in the subsequent Refresh phase. Again, the hidden information of Star Wars: Rebellion plays heavily into the game's experience, even as it takes a different role on the different sides. Every time you draw a probe card, or every time you draw an objective card, you are adding to the amount of hidden information existing within the game, and that means the stakes are always rising. Each Refresh phase, you advance the time marker one space along the time track. In addition to bringing the Rebel Alliance incrementally closer to its victory condition, this Refresh step offers you two different important choices, at intervals defined by the time track's iconography. Whenever the time maker ends on a space with the recruit icon, you and your opponent both gain the opportunity to recruit a new leader. You draw two cards from your action deck and choose one of the leaders shown on either card to move from your reserve to your leader pool. Notably, you recruit new leaders in each of the first four Refresh phases. Then you are done recruiting. 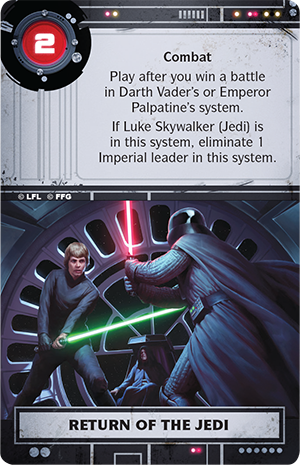 This means that you will not recruit all of the possible leaders for your side in a given game, and though many of the heroes, such as Luke Skywalker and Han Solo, feature on multiple action cards, if you pass on a chance to recruit a given leader, there is a very real possibility that you will not have another chance to recruit him. When the time track advances to "2," Elaine draws two action cards from the top of her deck, Undercover and The Millennium Falcon . 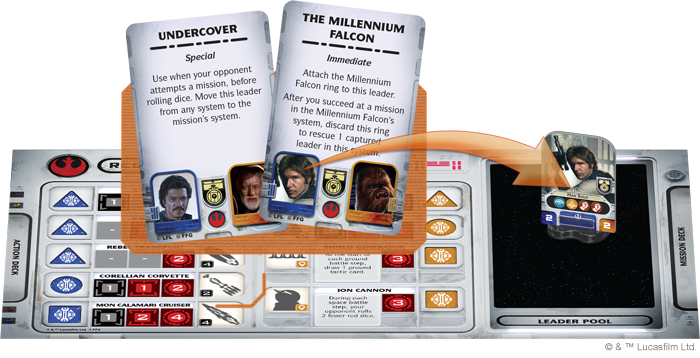 There are four leaders shown on the cards – Lando Calrissian, Obi-Wan Kenobi, Han Solo, and Chewbacca. Elaine gains the choice of any of the four leaders. Knowing that she might not have another chance to recruit any of these heroes, she decides to recruit Han Solo. In the learning game, these action cards are discarded after you recruit your leader. In the advanced game, you hang onto these action cards and have the opportunity to use them later on for heroic, once-per-game abilities. The time track also features a second icon, the build icon. Whenever the time marker ends on a space with the build icon, both players gain the opportunity to build new units. For each resource icon associated with the systems loyal to your faction, you take new units from the supply and place them on the build queue, setting them atop the space corresponding to the number to the left of the system's resource icons. The units that you can build are indicated on your faction sheet, sorted by their resource icons. For example, when the time track proceeds to the "4" space, the Rebel Alliance has managed to earn the loyalty of both the Nal Hutta and Toydaria systems. Since the "4" space features the build icon, Elaine gets to build new Rebel units and decides to start by building the units she gains from Nal Hutta and Toydaria. Toydaria features a single blue circle resource icon, which corresponds to only one Rebel unit – the Corellian corvette – so Elaine takes one Corellian corvette from the supply and places it on the "2" space of the build queue indicated by the "2" to the left of Toydaria's resource icon. Next, she looks to Nal Hutta, which features one orange triangle resource icon and one blue triangle resource icon. Again, the orange triangle corresponds to only one type of Rebel unit, the Rebel Trooper, so she takes one Rebel Trooper unit and places it on the "1" space of the build queue. Now she has a choice to make as she considers which of the different starships she would like to build with her blue triangle resource icon. She could build an X-wing, a Y-wing, or a Rebel transport. In order to gain more red dice with which to combat Karl's capital ships, Elaine opts to build a Y-wing and adds it to the "1" space of the build queue. In addition to the resource icons it gains from loyal systems, the Galactic Empire is able to harvest the resources of the planets it has subjugated. However, the planets that the Empire has subjugated do not build as efficiently as those that are loyal to its cause. For each subjugated system, the Imperial player builds only the left-most icon. There is one final, important consideration during the build step. You cannot build units from a system that contains an enemy unit. Insurgents on the ground can disrupt your supply chain just as well as blockades in space. In the final step of the Refresh phase, both sides advance their build queues. Each unit slides one space down, from "3" to "2" or from "2" to "1." Units that slide down from the "1" space are immediately deployed to systems that have matching loyalty or, in the Empire's case, that have been subjugated. During this step, the Rebel player may treat the Rebel base space as though it were a system. Just as you cannot build units from a system that contains an enemy unit, you cannot deploy to a system containing an enemy unit. Thus, as you see the build icon coming on the time track, you might consider invading your opponent's system when you suspect you might be able to hold either the ground or space theater and deny your opponent the opportunity to build with that system's icons or deploy to it. After their battle at Kashyyk, Elaine still holds the ground, and the system remains loyal to her. However, because Karl won the space combat and kept his Star Destroyer in the system, Elaine is unable to use Kashyyk's build icons or deploy to the system. Finally, after both sides have deployed all available units, you enter a new game round, returning to the Assignment phase. 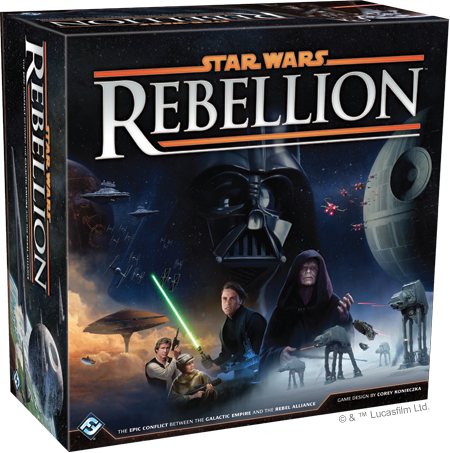 Both sides in Star Wars: Rebellion wage the Galactic Civil War according to the same rules, but their methods could scarcely be more different. The Rebel Alliance fights to inspire hope, conducting desperate secret missions and using its meager military presence to conduct surgical strikes. Its unpredictability is key. The Galactic Empire, on the other hand, has a navy that stretches across the galaxy, resources to burn, and penchant for torture and terror. If you play as the Galactic Empire, you are likely to feel a swelling of confidence as plant your boots firmly on planet after planet, but your overconfidence can be your weakness if you fail to give the Rebel threat its proper due. In our next preview, we will explore more of these differences, focusing largely on how they come to life through the game's projects and objectives. Along the way, we will also get a better sense of the game's asymmetry and learn how it helps invoke the spirit of the classic Star Wars trilogy!